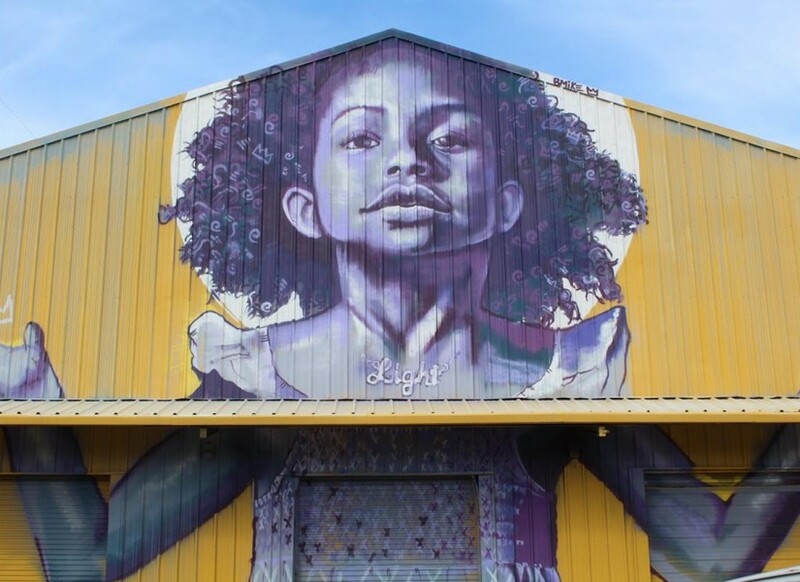 Studio Be, a 35,000 square foot warehouse in the Bywater, is the latest project by artist and activist Brandan Odums. Walking up the sidewalk approaching Studio Be, visitors are welcomed by empowering murals, scenic railroad tracks and winding bike trails. 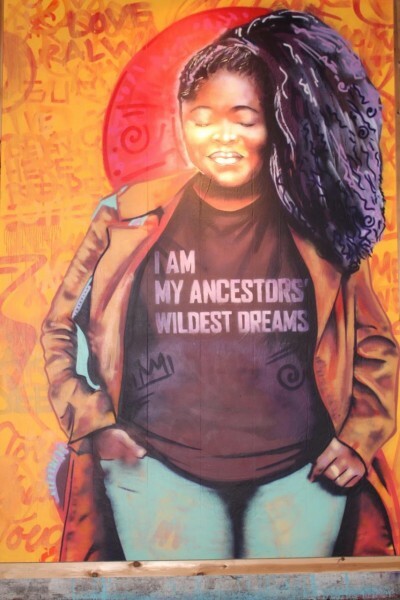 Depictions of powerful black women of all ages surround the outside of the warehouse walls and set the tone for what hundreds of local New Orleanians, celebrities and tourists from all over will see once entering the gallery. Odums paints with an intent to capture the community and express black narratives. Brandan Odums, owner of Studio Be and a visual artist, filmmaker and New Orleans native, however, didn’t begin his journey of mural painting with the afrocentric facility art-admirers see today. In 2013 he started painting graffiti murals of influential African-American leaders on the walls of the now-demolished Florida Avenue public housing complex. These murals, named #ProjectBe, gained national recognition and led Odums to start another series of murals on the West Bank entitled #ExhibitBe in 2014, which also garnered national recognition. In 2016, Odums opened Studio Be, a solo show in a 35,000 square foot warehouse in New Orleans’ Bywater district. With “Ephemeral Eternal” as the theme, the show emphasizes the presence and importance of black leaders like Martin Luther King Jr., Chairman Fred and Fannie Lou Hamer through thought-provoking and powerful imagery. While studying film at the University of New Orleans, Odums found his biggest artistic influences came from his appreciation for black history. The messages of black empowerment that came out of the Black Panther Party left an indelible mark on the artwork that Odums creates. Odums’ art sends messages that speak to the continuing narratives of black history. Touring Studio Be, one is immersed in a myriad of black perspectives that include local community leaders and celebrities of New Orleans, such as Tank from Tank and the Bangas, as well as others that show messages of change and empowerment. Odums’ studio gained national attention when filmmaker and director Ava Duvernay used one of his pieces, as well as Odums himself, in a pivotal scene in her show “Queen Sugar” to show the impact of art on the Black Lives Matter Movement. 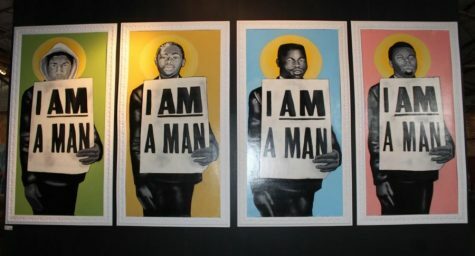 Four portraits displayed on the same canvas, each of a recognizable black male slain by police holding signs that read “I am a Man,” take their rightful place on the beginning row of the studio. Walking past these portraits is impossible without first examining the elegance and strength that emanates from the beautifully painted eyes of each figure. Upon reflecting on the importance of each piece, one particular memory stood out to Odums — Sabrina Martin, the mother of Trayvon Martin, came in to view the portrait of her son along with three other young black men. Historically, artists have often used their work as platforms to express outrage and invoke change where they see pain, suffering and injustice. This type of usage and awareness of platform is often coined “activism,” but Odums has a different opinion about the word. In addition to visiting the Studio Be warehouse in the Bywater, Tulane students can learn more about Odums and his work at a Q&A session on March 7 in Dinwiddie Hall. Hey, really appreciate this piece. What time is the March 7 Q&A in Dinwiddie Hall?